these two matches, Charlton have won one game (versus Orient), drawn twice (at Oldham and Bristol Rovers), and lost twice (to promotion chasers Southampton and Huddersfield). So how have we done? Not great, but better than it was during February and March. Without going over old ground, many of the team seem to have been as desperate as the fans for the season just to come to an end. With little to play for, nobody was putting much on the line for quite some time, until there was a slow realisation that slipping down the table at such an alarming rate could have ended in relegation. The win against Orient halted that slide, and the points subsequently picked up have extinguished any threat of slipping into League Two. The slight upturn in results haven’t seen a great enhancement in play though, with Charlton actually quite lucky to beat the O’s (who hit the bar twice in injury time and had a goal disallowed when the scores were level, let alone the goalie assisted second goal for BWP). Rovers (Basey Justice?) 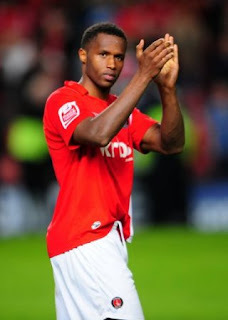 and he was soon joined by Jose Semedo, also for a second yellow, though his was for what seemed an innocuous clash. With Johnnie Jackson out injured for some time, Joe Anyinsah unable to complete two games on the trot, and both goalkeepers Rob Elliot and Ross Worner struggling with injury, the squad has been stripped bare of what may normally have made up the starting eleven. Despite these changes, the side that took on Rochdale in the home return game on Monday did quite well. Without much option, Therry Racon returned to the left side of the pitch and put in his best game of the season. The partnership between him, Parrett, and Michael Stewart in midfield looked good, with the three interchanging as the game dictated. was who scored from a corner). The only reason he can be ahead of Solly is due to his height, and there is a case for having him play when we know we will come up against teams that play the long ball etc, though in actual fact he rarely gets his head to a ball whereas at least Solly competes. Up front, and without any other claimant, Bradley Wright-Phillips got the captains armband, and he put in a good shift. Sometimes he can appear very lazy (probably because he is? ), but this was him at his best regarding work-rate. He does shoot at every opportunity, but so what. Out on the wing was the lightly used Eccleston; I understand managers liking Scott Wagstaff for his effort and fitness, but @NE39 does have the edge in terms of speed, skill, and vision. 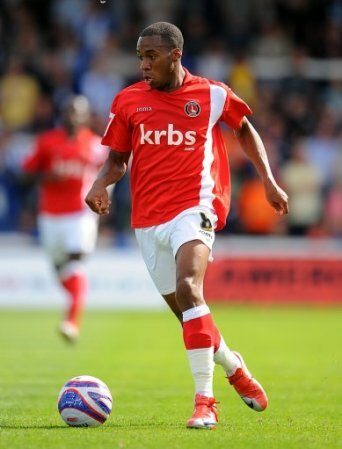 An honourable mention should also go to Marco van Benson, who has taken his chances recently and been a much better all round player than he looked at any other stage of his Charlton career. So much better, then, but still not quite where we need to be. Of the team that started on Monday, only four are under contract for next season (Francis, Benson, Wright-Phillips, and Doherty); it is obvious that with upwards of 14 players out of contract, and with five others here on loan, major changes will be made to the squad. w to a permanent deal, and he may well get one, but I doubt we will see Eccleston, Parrett, or Frank Nouble at The Valley next season. The issue is whether the players kept on will be the better ones, and if the replacements in the squad will improve the team, or just the training ground? The Rochdale match was my last of the season, as I have another fixture to attend come the Hartlepool game, so it was lovely to sign off with a win. My player of the season is the one who comes from Portugal; I voted for him last season and he came second, so I hope he wins this time. At least I can now say that I have seen him score! His only real opposition is Jackson, but he’s missed to many games through injury I think. It would be a nice way for him to sign off if he is not to return next year. My next blog will be my thoughts on each player this year, and my advice to Chris Powell over whether they should be allowed a squad number in 2011/12.